Qutub Minar is a towering, construction of 73 m height, built in 1193 as a symbol of victory over Indian Hindu kingdoms by Qutab-ud-din Aibak. It is one of the finest monuments in India and Qutab-ud-din Aibak could only complete the basement part. It has a total of 5 storeys. The first three storeys are composed of red sandstone. The top two storeys are made of sandstone and marble. It has parts which are taken from the 27 Indian Hindu temple raided by Muslims. There are bands of inscriptions on the tower as ornamentations and has four projecting balconies. The architectural style of the tower is Iranian and yet has adopted a hybrid style of local artistic conventions such as garlands, lotus, bells etc which are typically Hindu symbols. It was built by Hindu artisans. Quranic texts are engraved on the outer walls. There are several calligraphic designs and decorative motifs on the tower’s upper section. The construction was started by Qutab-ud-din Aibaks in 1193 and its construction was completed in 1197. Additional modifications were done by Iltutmish in 1230 and also by Alla-ud-din Khilji in 1315. This place is UNESCO World Heritage site. A lot of Bollywood films have been shot in this destination.The Famous song “Dil Ka Bhanwar Kare Pukar” from Tere Ghar Ke Samne by Bollywood actor and director Dev Anand. If you are in Delhi as tourist Qutub Minar is one place you don’t want to miss. For visiting Qutub Minar there is no specific season which is suggested. This place is open for visitors on all 7 days in a week. The place is opened for its visitors from 7 am to 6 pm from March to November and 8 am to 5.30pm in winters. Visitors are allowed on all days includes public holidays. Delhi is too hot during summer and pretty cold in winters. Since the place is in open space and not many shades are available its recommended to avoid plan in summers. The central part of India goes more than 45 deg C during summers. In winters it will be a chilling experience to roam around and explore Mughal history. October to march is would be a great timing to visit Delhi and surroundings. If you plan the visit in this season along with Qutub Minar you may be able to enjoy many other nearby places in Delhi & surroundings in a cool weather. Tourists can spend a whole day in Qutub complex wondering about the creative architectural style and construction of red stone structures. Near Qutub Minar, there are various Iranian style architectures available such as Tomb of Imam Zamin, Quwwat-ul-Islam Mosque etc. The mosque is located within the Qutub complex and it t has a very distinctive arch, called the Alai Darwaza. 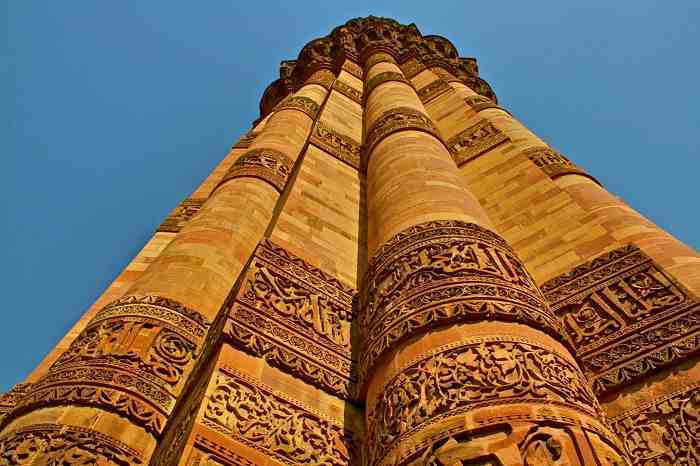 Qutub Minar showcases some of the most intricate designs. Qutub Minar has a very impressive architectural innovation and construction quality is very good. It is built of gray quartz, red sandstone, and white marble. The traveler can also opt for Delhi tour which gives a good overall tour of Delhi such as the red fort, parliament building etc. Visitors also have an opportunity to go to Mehrauli archaeological park in which they can enjoy the grand 1000-year-old legacy of the Muslim architecture. 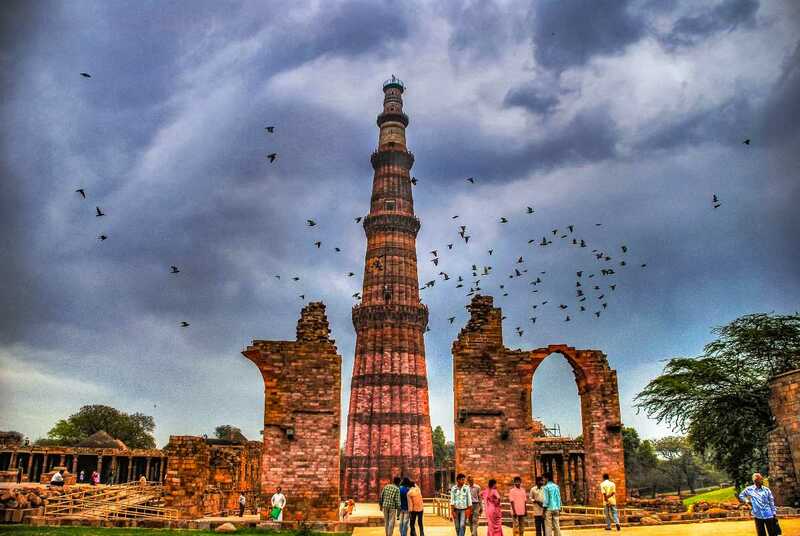 Qutub Minar is a great spot having picnics and also famous for artistic gems. 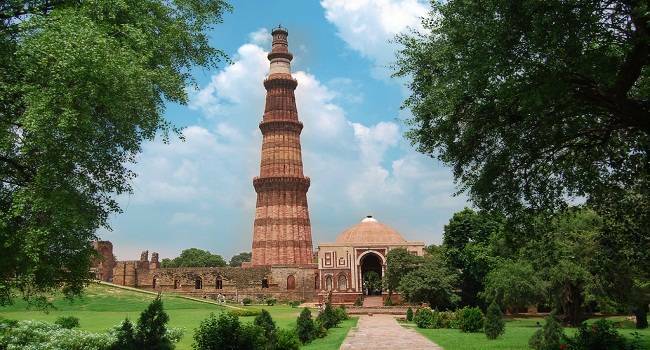 There are various medieval art galleries and rooftop restaurants which provide the spectacular view of Qutub Minar. The iron pillar of Delhi is a must-see destination which boasts the metallurgy technology developed in the 3rd century India. The composition of the pillar has rust-resistant alloys and is a testament to Indian superiority in science since ancient times.it weighs over 6000 kg and is made of wrought iron. Delhi is well connected with metro rail. The tower is located in Mehrauli and you can reach the place by train. There is a train stop Qutub Minar. You can reach from various parts of the country by flight. There are regular flight services from Delhi to Bangalore, Hyderabad, Chennai, etc. The travelers can also opt for traveling on the train. Since Delhi is a junction various trains pass through it and has the good amount of connectivity with all parts of India. 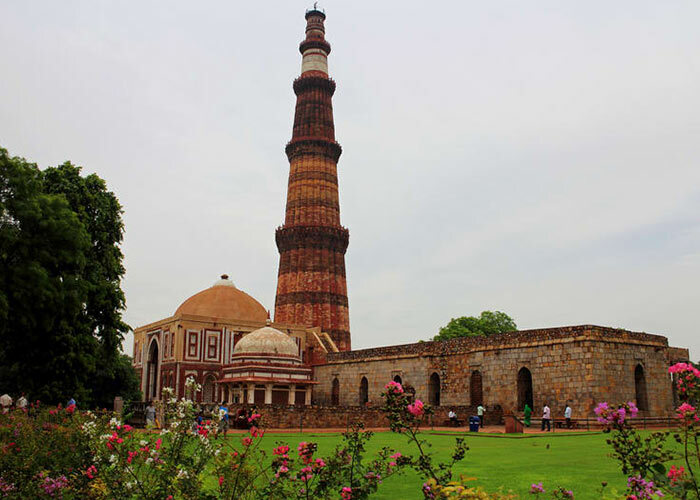 When you are visiting Delhi you need to plan Qutub Minar on day one in the morning. After visiting Qutub Minar you may plan for Humayun Tomb, Lotus temple, Jain temple and further city malls. The most important part is when you visit Qutub Minar you will see iron pillar and a ritual needs to be followed. You need to stand near the pillar facing outwards and try to hold the pillar by your both hands and you should try to touch the fingers of both the hands to each other. This will enhance your luck and charm if you could able to touch the fingers of both the hands. It is recommended to keep sweaters and jacket to carry and wear during winters. One woolen cap will protect you from the chilled wind. Need to have good water consumption as this place is very large and a lot of walking is required. Use metro for commuting, its available throughout the day and daily passes are available. Cycle rickshaw and auto rickshaws are another recommended mode of transport. Before entering into the vehicle kindly check in google where to go and approximate charges. Based on the evaluation make good negotiation with the driver and then only commute. Find a rooftop restaurant in Mehrauli and you should enjoy the dining with a magnificent view of Qutub Minar. Most of the good restaurants have a rooftop garden and good visibility of Qutub Minar from the rooftop. Buzzaria Dukaan is a must visit place for shoppers where they can find all kinds of traditional handcrafted items at low cost.